New Yorkers of a Certain Age will remember the elevated West Side Highway — constructed on pillars over West Street and 12th Avenue in the 1930s, it connected downtown Manhattan with the Henry Hudson Parkway uptown. It was constructed in the early 1930s and was originally called the Julius Miller Highway for Manhattan’s borough preseident at the time it opened. I remember it only from cab rides in the 1960s — it was a thrilling, though some would say, unnerving ride, as its original Belgian bricks remained un-blacktopped in most spots, and it took several sharp turns. Things were especially hairy during rainstorms. On and off ramps were located in the center of the roadway, necessitating expert driving skills to get on and off. The roadway suffered from deferred maintenance over the years, and In December 1973 a dump truck carrying 30 tons of asphalt crashed through the roadway along with a following automobile (killing neither driver). The WSH from the Battery to 18th Street was closed immediately, and other sections closed after that; the superstructure was finally torn down in 1989. Before that, a proposal for a new expressway sunk under parkland along the same route, called Westway, was defeated because of environmental concerns; after 1989, the present surface roadway was settled on. In recent years bike paths and parkland have been added along the shore that had formerly been riverside docks. 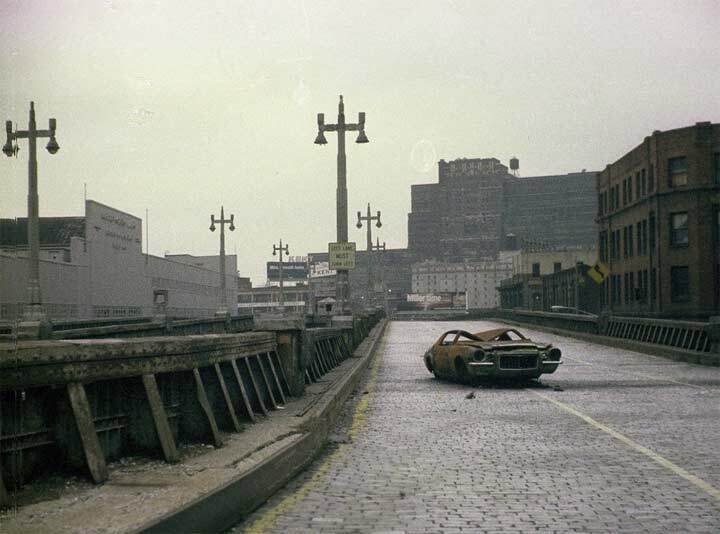 West Side Highway in 1975. As the roadway remained in place, it became an unofficial version of what today we have in the High Line — pedestrians would come up (illegally), sit in the sun, walk around or play Frisbee, and motorists would abandon cars on the still-bricked roadway. A view from just before the elevated highway closed. You can see the deterioration as chunks of concrete have worn away, revealing iron supporting rods. The allowance of city management to allow roadways as well as other infrastructure like subways and bridges into a dangerous condition is one of the more perplexing episodes in NYC history. The deterioration lasted for decades, but it was especially felt in the 1970s and 1980s as the West Side Highway collapsed, the subway lanes on the Manhattan Bridge were closed off and on for over 20 years, and the Williamsburg Bridge was in danger of closure and replacement. Eventually billions of dollars were allocated for city infrastructure repairs that would have been cheaper if simple regular maintenance was maintained. However, in NYC, its basic infrastructure is used by everyday people instead of Those Who Matter, and priorities are elsewhere much of the time. One piece of original fencing and lighting remains: a closed off-ramp where the West Side Highway and Henry Hudson Parkway meet at West 72nd Street. I would imagine the piece is still there for purposes of structural integrity. 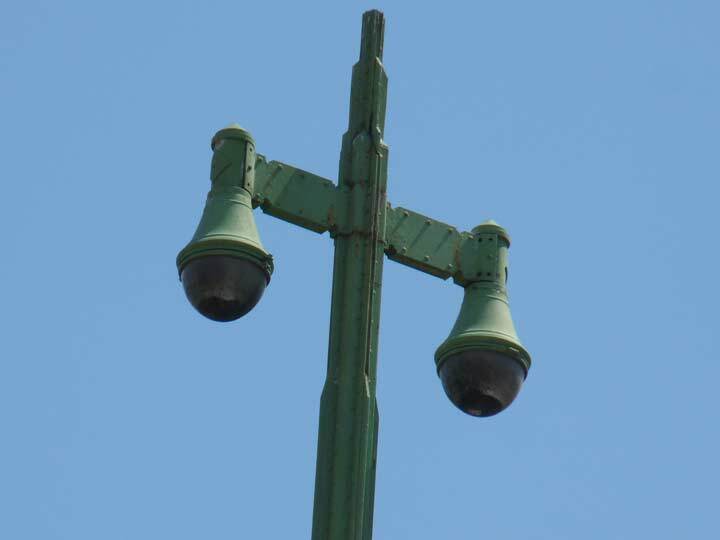 The lampposts date to the early 1930s when Machine Age design, a 180-degree response to the ornate Beaux Arts period that preceded it, was in full flower. Exposed rivets on these posts speak to the effect the designer was trying to effect. Note also that the posts bases and top finials imitate the ziggurat, or stepped, towers that were mandated in 1916 to allow sunlght to reach the streets. I remember this elevated highway very well as my dad would sometimes drive down along this in one of the succession of old Volkswagen beetles he used to own. Ill never forget the feeling of the vibrations the car would make as it travelled along the Belgian blocks. As a child I was always fascinated travelling along these roadways (including the BQE) as I would view the neighborhoods that lined the highways with astute vigilance especially the warehouses of the far west side. My parents both worked in buildings that once occupied the location of the original world trade center and I remember when the area was being demolished for their construction. I have that map. From the Seventies. Served me well over the years. Always liked the folding method. Is the scene or De Niro in taxi driver, as he gets out of the taxi company and walks with the West Higway in the back ? When my father learned to drive back in the 1950’s, his instructor told him that if you could drive on the West Side Highway, you could drive anywhere. I dare venture to guess that the driving instructor has never been on the Schuylkill Expressway in Philadelphia, especially eastbound [towards town] in the morning. 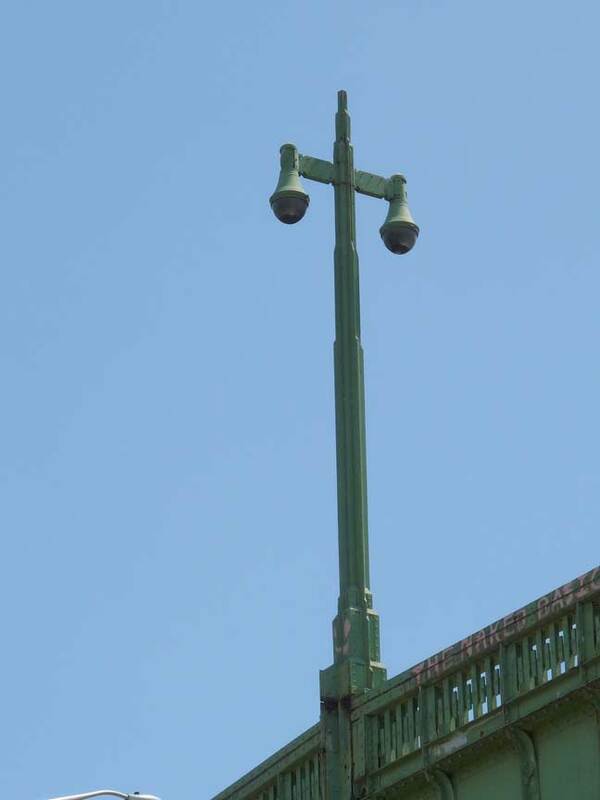 Some of the light fixtures in Hudson River Park imitate the ziggurat designs of Miller Highway. 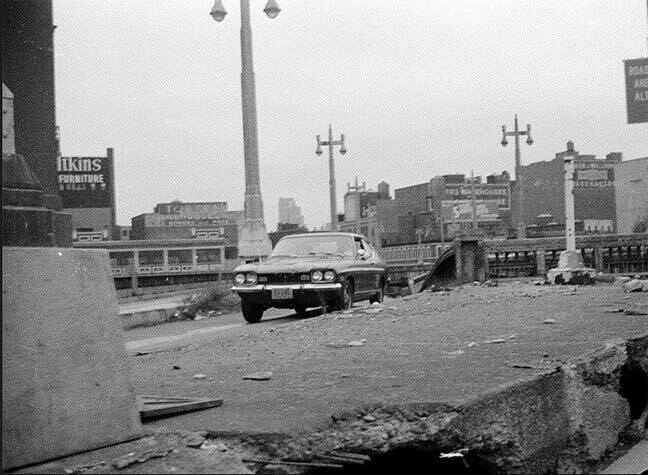 Did the former elevated portion ever have any ramps for entering or exiting or was it just an expressway all the way through? There were ramps for exit and entrance at many important east-west cross streets. Going south to north, I remember Canal St., 23d Street, 42nd St., and 57th Street. The hairpin turns at 23d Street were especially dangerous. At the south end the WSH connected directly with the Battery Tunnel and the underpass below Battery Park. I remember riding down the West Side Highway in the early 60s with my Dad (in a 62 Rambler American station wagon) when I used to go to work with him on Saturdays at NYU’s Testing and Advisement Center at 51 West 4th St. I vaguely remember the Belgian blocks, but the zig-zags are what stick in my mind as well as seeing freight cars on what’s now the High Line (and wondering where were the subway trains). Dad switched to the Lincoln Tunnel for the ride, so no more West Side Hwy, but I did get to see Penn Station before they tore it down as a trade off. I never got to drive the WSH, the dump truck fell thru just as I got my driver’s license. I do remember it being a “hairy” ride. 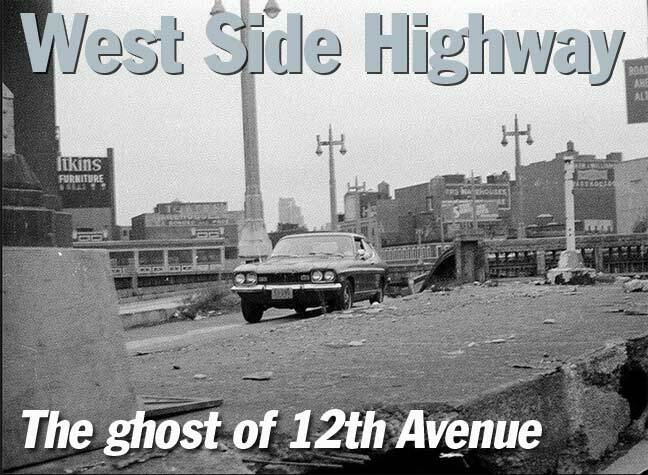 The vintage photos of the Westside Hwy in the bad old days look like they could be the setting for another apocalyptic zombie film epic. Fifty years ago the WSH was like an amusement park ride: the vibration from the brick roadbed was the soundtrack, the sudden turns were like a horizontal roller coaster, the obsolescent & changing lower west side scenery contrasted with the ocean liners & cruise ships at the west piers. It was quite a ride, especially at night. Love the vintage Mercury Capri. BTW: the 1970 or so Camaro wasn’t “abandoned” – it was stolen & cannibalized. Rampant crime was a feature of Mayor Lindsay’s “Fun City”. Thanks for reminding me of the Spry and Maxwell House signs! I used to drive the West Side Highway everyday when I drove my kids downtown to St. Ignatius Loyola down on the UES. I lived in Inwood, just above Washington Heights. We moved out of the City before the “Highline” as it is now was “built”. It really saddens me to say this, but I preferred The City the old way–I mean, we ended up leaving NYC because it just got too expensive. Now it’s just a haven for the wealthy. While the highline is really beautiful, and Chelsea Piers, etc..are all well and good, with that comes the destruction of the middle classes…I need to stop. Thanks for a great post!!! The car pictured (with wheels) is a 1972 Mercury Capri. Speaking of the Ford Probe, I think it was one of the best built cars of its era. I had an ’89 Probe that could could just about anywhere, even in deep snow and dirt roads meant for 4WD (mostly). Of course, the streets of NY and the rest of downstate were no problem. Unfortunately it met its demise in ’96 when a miscreant cow decided to cross its path. Back to the WSH, back in the 70’s I remember taking it back and forth to Brooklyn to see my grandparents. My brother and I would look forward to find the lit YALE truck rolling across the night sky albeit in a stationary fashion. I was always enchanted with the extremely detailed forms that would sometimes litter the streets as the demolition moved forward. I remember asking my Dad if we could take one of the forms home since it appeared nobody else wanted them. After all, we had plenty of room in the trunk of our “boat”, a ’73 Fury III. Some of my fondest NYC are of walking the abandoned WSH from Canal St to the Battery in the late 70’s! It was awesome! You had the Hudson River on one side, and a mix of ancient buildings and new ones (like the WTC) on the other; and could just walk or jog or skate or cycle, uninterupted, with no cars or distractions. People would be up there sunbathing in the summer; artists would cover the roadway with murals; it was my favorite thing to do in all of NYC- much better thyan any multi-million dollar park. If it were still extant, I’d come back (from 1000 miles away) just to walk it again and relive the memories! I walked it once during a snow storm…..got the most beautiful views of lower Manhattan I’ve ever seen. One could almost like and enjoy NYC in the 70’s- when they didn’t have the money to mess with everything and ruin it! (And when you got on a subway, it actually went where it was supposed to go- instead of perpetual detours [“G.O’s”] and reroutes. I used to drive down the West Side Highway, coming from Peekskill on the Saw Mill and Henry Hudson Parkways, and later from Kingston on the GWB. It was a bumpy ride. I always stayed in the middle lane to avoid debris. I’d get off at Chambers St to cross the Brooklyn Bridge. The markets were still quite busy in the 50’s and early 60’s. I drove the washboard before. Heading upstate to Unadllia, N.Y. from Sunset Park, the WSH was where I picked up some of my driving skills also. With my father catching a snooze after work , I’d buzz along that road in a 1959 Dodge Polara station wagon and there was a whole lot of shakin’ going on! Pass the “All The News That’s Fit To Print” (The New York Times) ad, the Pinch ad, TAB cola, etc. on the way back (mostly at night) across the river in Jersey. The automated neon had the cup tipping over with drops of coffee dripping out. Great stuff! I remember a great big neon clock also, but I cannot quite see the advertizer. Bulova maybe. I remember exiting the WSH along the base construction of TWC. 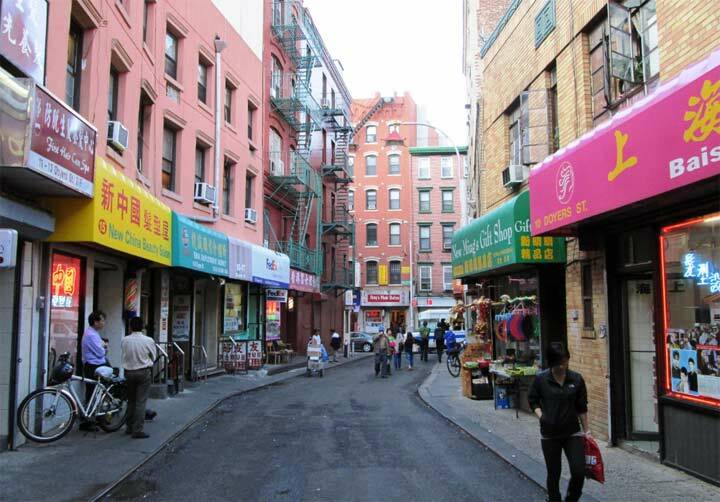 Use to walk up the WSH at lunchtime from Wick’s Printing on Duane St. I loved the WSH but only as a passenger, I remember some holes (with daylight coming through the pavement) toward the end. It was the quickest way up the west side, especially if you were heading to the GW bridge and New Jersey from Brooklyn. I was always annoyed at the manhattanites who insisted on no replacement as it was “unnecesary” (to them.) Wasn’t the clock on Colgate-Palmolive in Jersey City? How about the coffee roast smell that came across the river? Thanks David, I belive you just nailed the sign! How did I forget that truck. Had the moving lightbulbs on the tires to give the effect of it driving right at you! I remember going to classes at Carnegie Hall & driving on the West Side Highway to get there, about 1977…It was like driving through a mine field! I remember seeing a pothole that went straight though where you could see the street below.